It seemed like every second day we would be out driving and doing things around the island and quickly realized we needed to created a calendar and group some activities in order to ensure we did not miss any. This bit of organization proved to be crucial as we found ourselves overwhelmed thinking about all we had planned. Our place of residence on this island did not help matters. Our home for the next 40 days on Oahu was the town of Makaha in the district of Waianae. This is on the dryer side of the island and pretty far from the main city of Honolulu. It is also the part of the island that does not connect to a road to create a loop. We were pretty close to the end of the road with no where to go but back into the city. This was a 30-45 minute journey depending on traffic. Our accommodations at the Makaha Valley Plantation were spacious but not the nicest to look at. Let’s just say it looked well lived in, but the price was right so we had very little to complain about. 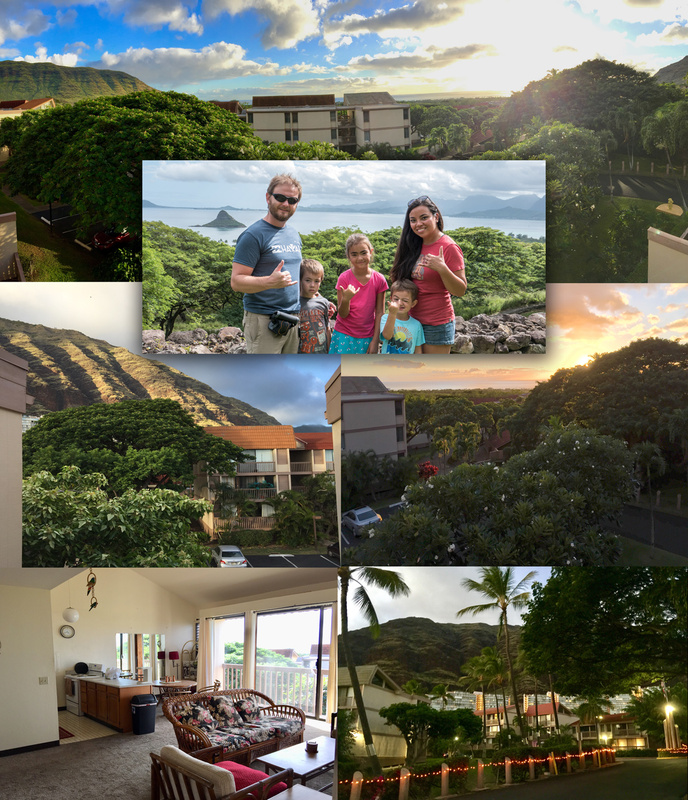 We had a 3rd story (top) condo rental overlooking the ocean (about a mile or 2 away) in a nice valley, situated between two mountain ridges. What this dwelling lacked in fit-and-finish it made up in scenery. The view we had was marvellous, especially on new years eve, when we could see the whole shoreline shooting of fireworks for hours. We had 2 bedrooms and a spacious kitchen and living area. The decor was dated and the colours rather dull. We had the two geckos visit our walls regularly, whom we lovingly named Fernando and Mueller. They were welcome in our home because they ate the bugs that may have been crawling around. The grounds of this condo complex were very lush and beautiful. Plumeria trees filled the air with their amazing scent and peacocks roamed free to delight us on a daily basis. The occasional feral cat fight also kept us entertained at night. Although the area in the valley we were in was nice, Waianae has the appearance of a town with people fallen on hard times. It isn’t unsafe in any way but homelessness is an apparent thing, as is the charity to those in need. This made Waianae a place where we could share the blessings we have been given in a real way. There was a swimming pool right under our condo unit which allowed us to enjoy water on days when the driving to the beach was not ideal. As you all may know, Cynthia loves the beach and one of her favourites on the island was just 10 minutes away. This beach would become the location of many days spent soaking up the sun and the place we experienced the home coming of the Hokule’a traditional Polynesian canoe. Spending time at the beach was the filler in between the itinerary we had planned for December. Although we had 40 day on Oahu, at least 20 of them were to be spent out of the house. Having a good rental car was essential. We rented from a local company again, just like on Kauai, although this car was much cleaner and newer. It was good on gas, which was favourable for the amount of island exploring we would be doing. Just like Kauai, there would not be many activities that were new to Cynthia and I. We’ve been on Oahu 3 times before and have experienced much of what it has to offer, but we still planned a good mix of new and old experiences for the whole family to enjoy. Most of the things we did in those 40 days were the Honolulu area. We visited the Ala Moana mall, spent time along Waikiki beach and the strip, hiked Diamond Head, watched the Veterans parade, visited the classic Royal Hawaiian and Moana hotels (for the first time). We went up Aloha tower and visited our favourite shop; the Tin Can Mailman (where we bought our Hula girl many years back), plus a few signature tourist activities like visiting the famous bakeries around town serving poi donuts and other pastries. We also toured the beautiful Iolani palace for the first time, reliving the age of Hawaiian royalty. No visit to Honolulu would be complete without seeing the Friday night fire works, which we did on a couple of occasions. We spent a day exploring Pearl Harbor and the kids completed the junior ranger program to earn their badges. On the windward side of the island we visited Kualoa Ranch for the 3rd time, only this time we did a different tour of the ranch that included seeing the Indominous Rex paddock from Jurassic World. The kids loved it! The tour explored the history of the ranch and the landmarks from the past that are found there, although most of that was forgotten when we saw the movie set. The Polynesian Cultural centre is just down the road from the ranch and it was a place we wanted to visit for years. I’m glad we waited until the kids were here with us to experience it with us. It was a blast! we spent two days exploring 6 Polynesian cultures throughout the centre (Hawaii, Tonga, Fiji, Tahiti, Aotearoa and Samoa) experiencing their food, traditions, art and cultural nuances. Each one offer something different. The days spent there were riddled with activities for all of us to enjoy like canoe rides, dance shows and lessons, basket weaving, island sports and a special evening theatre presentation with fire dancers (Jenson loves those). One of our favourite places on the island is The North Shore and the town of Haleiwa. This is a surf town and it is bustling with tourists and locals alike. We had the pleasure of being on this shore for one of the most famous surfing competitions on the planet: The Pipe Masters at Bonsai Pipeline. Back for the competition was Kelly Slater, who was out for 6 months due to a foot injury. He is arguably the best surfer alive so it was a treat to see him in the water. At this event we also met our favourite vloggers, Mike and Drea. Actually just Mike and his buddy Artem. Drea was back on the big island tending to their daughter Coral. As fans of Disney we were pleased to learn that our accommodations were just 20 minutes away from the Aulani Disney resort. Although we could never afford to stay here (about $600 CAD a night), the grounds are available to all, as is the beach front. We spent many days dining, sun bathing, walking around and enjoying the sites here. The allure of this place was evident to us and we found ourselves returning often. Christmas and new years wasn’t a big event for us this year as far as decor, dining and tradition. We bought a tiny Charlie Brown tree and had the kids decorate the wall with some crafts. Our Christmas movie collection was back home so we were limited in what we got to watch, but at least we had “A Charlie Brown Christmas”. We spent Christmas dinner at the Turtle Bay resort watching fire knife dancers. Not very traditional but at least we were together. We missed the snow once again this year. This was a bit sad for us since our home town received a bountiful blanket of white in time for Christmas. This made us miss home and all our family and friends. As we were setting to leave the island we were sad to part with our short-term church family at Aloha Nani church. Pastor Mike Bui and the church family made us feel welcome and included. We enjoyed our Sunday mornings with them, the picnic by the beach witnessing the joy of several baptisms and helping to serve veterans at Christmas. It was a blessing to us and our family. We left Oahu on the 3rd of January. and subscribe to see our newest videos as we post them. Currently we posted a history of our family trips since Cynthia and I started dating, along with some other fun videos I’ve made and trips I’ve taken. It’s a great way to get to know our family a little better. We are compiling a backlog of videos to make beginning at the start of our journey and hope to get them up soon. After that we hope to make a weekly video.